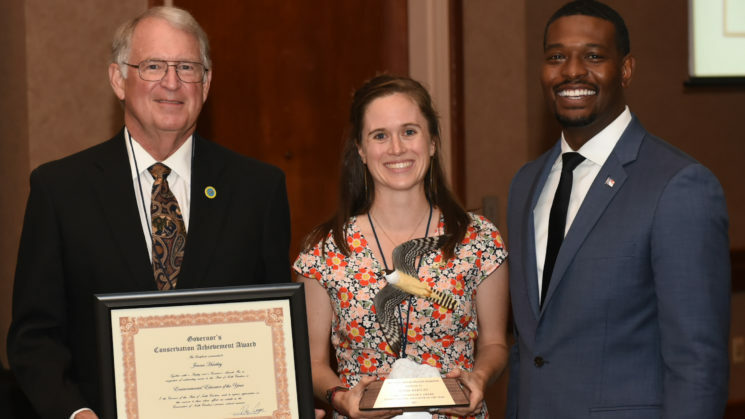 Above: Robert Brown, NCWF’s Immediate Past Chair of the Board (left), and Secretary Michael Regan of NCDEQ (right) present Jenna Hartley with the Environmental Educator of the Year award. Courtesy of the NC Wildlife Federation. Jenna Hartley has received the Governor’s Conservation Achievement Award for Environmental Educator of the Year. The North Carolina Wildlife Federation presents the annual awards — the highest natural resource honors in the state — for unwavering commitment to conservation. During a field trip in college to the Colorado River, Hartley became interested in geology, and new opportunities soon took her to Montana and Puerto Rico to conduct research. These opportunities encouraged her to go into teaching and to provide similar experiences for her own students. After serving as a high school science teacher in North Carolina and New York, Hartley became an Association of Schools and Programs for Public Health Environmental Health Fellow, hosted by the U.S. Environmental Protection Agency. She created K-12 curricula through the EPA’s EnviroAtlas Project using EPA research and training tools to support teachers in environmental education, while also using her bilingual skills to reach diverse populations. In addition to her continued work with the EPA and EnviroAtlas, Hartley currently is studying for her doctorate at North Carolina State University, where she works with Kathryn Stevenson on a North Carolina Sea Grant project to study intergenerational learning and student empowerment through science.